I never cared much for the Grateful Dead. Sure, American Beauty was good. So was Workingman’s Dead. In fact, both albums were very good, but the band never really had a decent rock singer—and you’ve got to have that, if you’re going to play rock, blues or R&B based material. Pig Pen, the band’s early blues voice was functional at best. The same thing could be said for the bands attempts at R&B, which were generally sung by Bob Weir. Weir was a sterling rhythm guitarist, but as a vocalist, he was about as competent a singer as what you might find in an average bar band. Garcia, was the lone exception. His frail sounding old man voice was ideally suited for Americana, and the bands sometimes raggedy musical approach had the kind of easy, unrehearsed quality of true folk music, even when they were playing electric. In that regard, The Dead were about as good as any band of the period. What the band lacked in vocal muscle, they compensated for with solid vocal harmonies. Still, neither Garcia nor the band ever really caught on with me personally, beyond an occasional listen. ​Then, I heard The Pizza Tapes about a decade ago, a series of sessions recorded at Garcia’s home studio with the brilliant Tony Rice on guitar and the equally brilliant David Grisman on Mandolin. These weren’t Dead sessions. This was Jerry Garcia in his element, as he’d started out in his pre-Dead years playing folk music and in various jug bands, minus the jugs. I’d initially heard both Rice and Grisman on Grisman’s 1978 recording, “Hot Dawg” featuring the legendary Stephan Grappelli, who’s work with Django Reinhardt, way back in 1930’s remains an infinite source of inspiration for improvisational musicians. Grisman had pioneered a type of music he called “Dawg Music,” which included traditional bluegrass instrumentation, played by a group high powered, young virtuosos pushing the boundaries of bluegrass to their limits and beyond. Swing was also a part of it all and “The Hot Club of France” ala Grappelli and Django was a key piece of the music’s sound. Even then, in 1978, Tony Rice was probably the greatest living bluegrass guitarist. As a kid he studied with Clarence White. White was a one-of-a kind innovator, both as a pioneering country rock electric guitarist with “The Birds” and probably the greatest acoustic flat picker that ever lived. Doc Watson being the lone possible exception. Like White, his mentor, Tony Rice has one of the finest pure acoustic guitar tones ever recoded, and his impeccable sense of time and syncopation are the gold standard that other acoustic bluegrass players measure themselves against. He was also one of the first bluegrass guitarist who’s approach encompassed elements of modern jazz, using altered harmony to create the sense of playing “Outside” while still maintaining a thoroughly bluegrass sensibility. Grisman was older than Rice and had been one of Clarence White’s primary musical partners. Both men were 1st call session players as well as band mates. More than any other figure Grisman pioneered the melding of Djangoesque, European styled jazz and modern bluegrass. But, instead of Clarence White as his guitar partner, Tony Rice stepped in to fill the void left by White’s untimely death at the age of 28. In other words, given the present company, Garcia was swimming in very deep water. 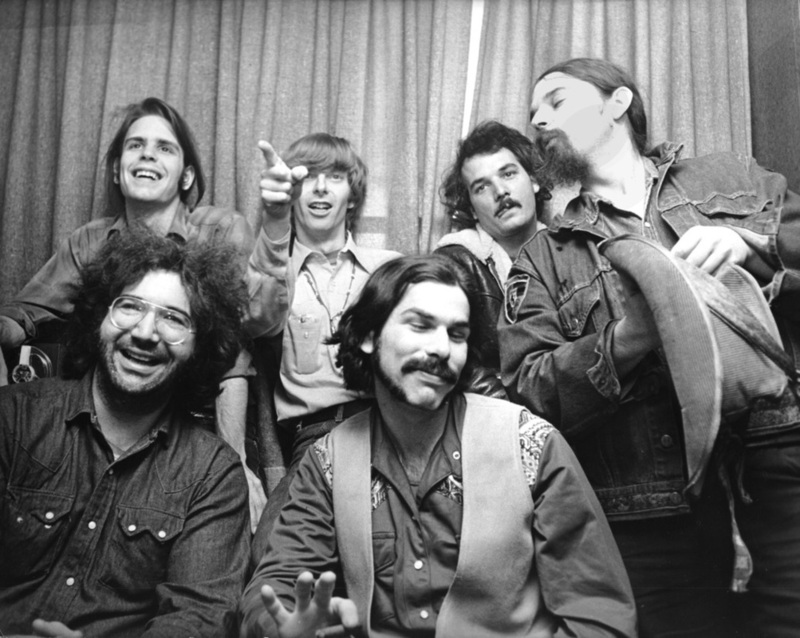 ​From there, my reevaluation of Garcia and the Grateful Dead was furthered by the remarkable ”Internet Archive” a repository of virtually every bit of non-copyrighted material on earth, including a sizable number of Grateful Dead legal bootlegs. Most are very good sounding recordings from the bands early days to their later years. These live recordings made clear, to me, the Dead’s obvious influence on the Allman Brothers Band, which, I believe is undeniable, something that I’d always been aware of, but never really gave much thought to. You could hear Garcia’s clean tone and use of diatonic as well as pentatonic harmony in both Duane Allman and Dickie Bett’s guitar playing. Garcia’s country styled phrasing, which he’d adapted to a variety of musical styles, can also be heard in both men’s approach. At one time I’d regarded Garcia as a reticent virtuoso, whose tentativeness limited his appeal, unlike Duane or Dickie’s more overtly fiery and deliberate sound. As I listened more carefully, though, I began to see that his longer solos used understatement in order to build tension, with spontaneity as prime element, enabling him to keep the extended improvisations fresh, as opposed to playing exciting, but familiar clichés, which tended to be the norm in rock guitar circles. What surprised me more than anything was how good the Dead were as a band. When they were on, they were unlike any other group playing at the time. The Butterfield Band with Mike Bloomfield might have been an early influence, although, I don’t really know that for sure. The Dead, however, were only nominally a blues band, so at best, the influence would have been negligible. What also struck me was the debt the Allman Brothers Band as a whole owed The Dead in terms of sound, improvisational structure and approach, even in their compositional style. From the use of duel drummers, to Berry Oakley’s bass, right on down to their adaptation of the Dead’s mode of jamming, all the similarities were apparent. If you could copyright a sound, the Allman’s debt would be substantial. Finally, Bob Weirs rhythm guitar and occasional lead behind Jerry Garcia, tended to be wonderfully right and musically inventive. Weir’s role was indispensable, playing a generally thankless, but very necessary part, which requires thoughtful musicianship and humility. What Weir lacked as a vocalist, he more than made up for as integral sideman, and I mean that in the best possible way. So, decades after the fact, I’ve become a fan. Better late than never, I guess. Thanks to the Internet Archive for making the Grateful Dead’s bootlegs available. And, thanks to the band for keeping it all alive. What else can I say but, Keep on trucking mama.